YES! I made an account and successfully logged on! Now can I begin playing? NO! Of course not! You don't even know how! But that's what I'm here for ^_~. - a link to the imprint, which will give you same basic info on the company and its creators. Button 5: This is the alliance shortcut. There's a short summary of your alliance. Button 6: This is your hero; yes, this too is a button! Clicking on the avatar of your Hero will take you to the hero options page, where you can equip your hero, change his resource production, alter his appearance, and so on. You can also find information about Hero's health, number of available adventures, Hero's experience and link to auction. Also, current Hero's home is displayed here. Button 8: Here is the information about your current warehouse status displayed. 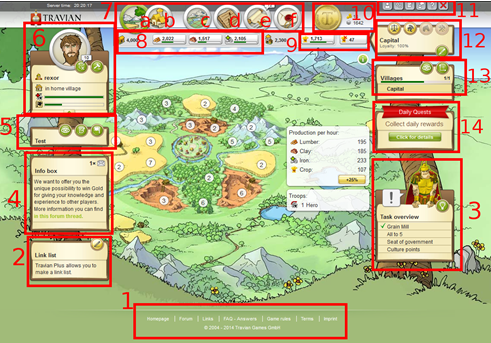 In case there's a gold bonus production running, a small green button is displayed. When clicked, you can see a summary about the production.